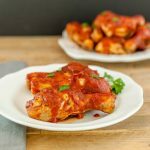 An easy oven barbecued chicken recipe with homemade bbq sauce. Place 12 chicken drumettes in a 10 x 15 inch casserole dish. In a medium size mixing bowl combine: 1 tsp paprika, ½ tsp garlic powder, ½ tsp sea salt, ¼ tsp celery seed, and ¼ tsp black pepper. Mix together. Sprinkle the spice mix over the chicken and rub into the chicken. Bake chicken in 400 F oven for 30 to 45 minutes, or until chicken is done. In a medium saucepan over low heat, combine all the barbecue sauce ingredients. Mix together, and turn up heat to medium high and bring barbecue sauce to a boil. Remove from heat. Remove chicken from oven when it is done. Using tongs, dip and coat each piece of chicken in the barbecue sauce, and return chicken drumettes to the baking dish. Place chicken back in the oven and broil on low for 2 to 3 minutes.